Everyone loves a good cheese at Christmas. Whether you’re thanking the host of a dinner party by providing a delicious cheese board, or you’re looking for gifts for cheese lovers, we have plenty of choice this season. NEW at Doddington Cheese for 2018 – our cheese tasting bags are a fabulous way of introducing friends and family to the award winning Doddington taste. Each bag contains four cheeses, hand-picked on the day of dispatch, with a minimum 0.6kg cheese content. This, presented in a red jute bag with gift tag and Doddington cow greeting card, makes a perfect present. We have cheese gift hampers available in three sizes – small, medium and large. All hampers have a selection of cheese, biscuits and a traditional home made chutney or a pickle. The ideal gift for the biggest cheese fan in your life. Lovingly cared for on the shelves at Doddington Dairy for at least several months while they mature, our full cheeses will arrive still waxed and branded ready for gift wrapping. See the full range here. This is a question we get asked a lot by customers buying cheese as gifts. Single pieces, hampers and tasting bags – once we cut our cheeses down to be vacuum packed, they will remain delicious for four weeks. When you order online, you can specify in the order notes when you would like to receive your cheese. All of our orders are sent on an overnight delivery service (Monday to Thursday only). So if you ask for delivery on or by a certain date we will dispatch it the day before (please opt for Tuesday to Friday only). Please ensure that someone is at the address to sign for it. 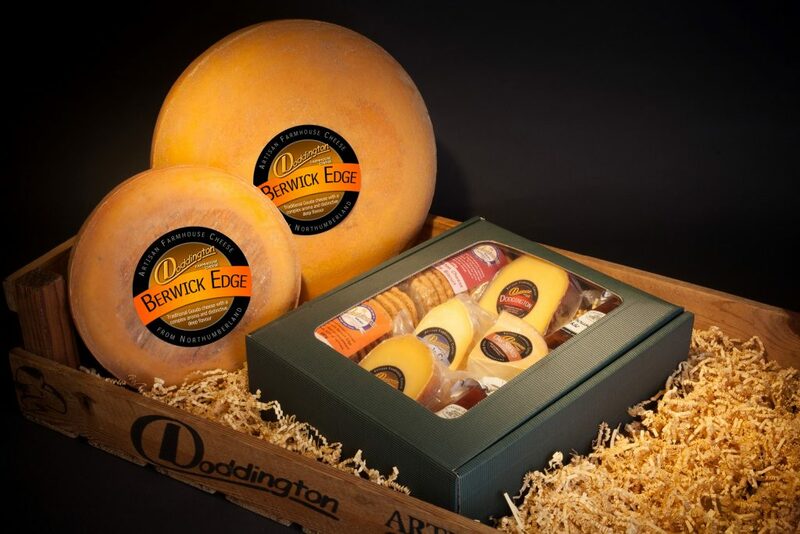 Full cheeses – you can keep our full hard cheeses (Doddington, Admiral Collingwood, Berwick Edge and Cuddy’s Cave) unopened for up to two months. However once you cut into the wax, the cheese will remain good for four weeks. Darling Blue and Capability Brown can be kept unopened for one month and will remain good for a further four weeks once opened. Our last date for accepting Christmas orders will be TUESDAY 18TH DECEMBER. These orders will be packed and sent on Wednesday 19th for delivery on Thursday 20th.